Oft-quoted down through the centuries, rural Scottish monks addressing All Hallows’ Eve liked to beseech in prayer: “Frae goblins an’ ghoulies, an’ lang-legged beesties, O Good Lord save and deliver us . . “ - but what about assassins hiding in the shadows of winding alleyways, knives in hand, or prowling highwaymen, who lie in wait to ambush a traveler merely for the coins in one’s purse, or the value of a horse? How about ghoulish corpses hung from courtyard archways, or screaming raiders galloping out of the night to sack entire villages with torch and spear? Better still, imagine bloodthirsty headhunters, tracking their quarry into foreign countries, whet-sharpened hatchets hidden ‘neath their cloaks? How safe would fears and worries like those leave you feeling, as you hasten home to your hearth, with long, dark October shadows deepening? 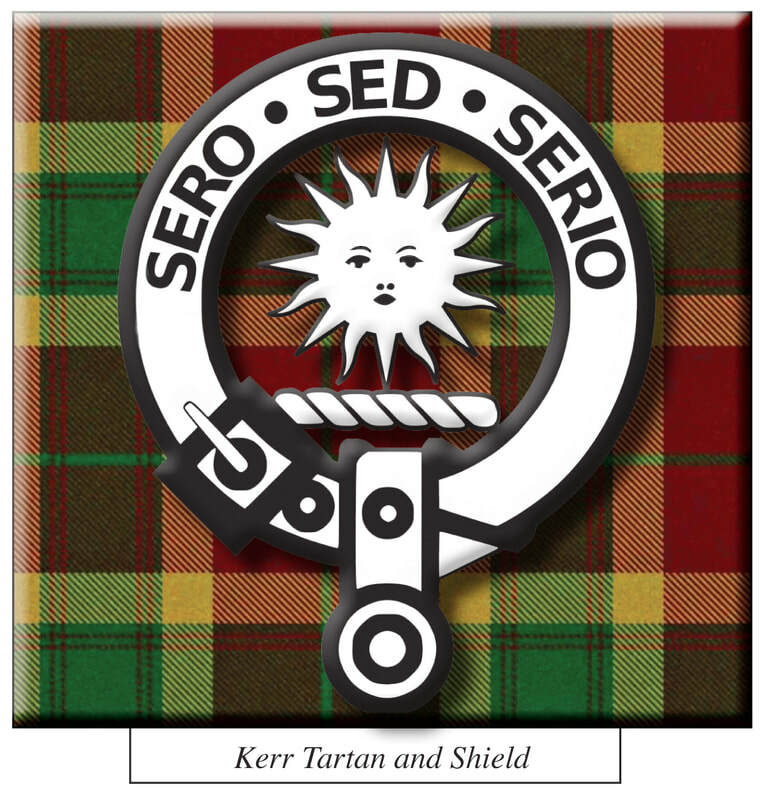 Clan Kerr, renowned for their status as both killers and lawmen, could perennially debate, as with the proverbial egg and chicken, which word had come first, and then inspired the other: their surname, or the ancient Scots term of ‘corrie‘ meaning “on the left” or “left-turning”? They were obviously linked: in the terminology of the Borders, the Kerrs have always been “corrie-fisted”, or left-handed, and by no random coincidence, either, for not only did the Kerr men build their keeps with doors and shutters opening to the left, and stairs which rose clockwise, but also trained their sons to be left-hand dominant in all practices, most especially in riding, hunting and war. Despite the Kerrs’ Anglo-Norman origin, having settled in the Borders in the early 1300’s, several published historians in the 19th and 20th centuries have suggested that their name could have come down from the Gaelic “ciarr” (dark-haired), or even the Norse “kjalr” (marsh dweller), but given this riding clan’s peculiar traditions, and their pride of Norman descent, it’s obvious to most Caledonian scholars that the “left-hand” origin is the correct one. The first progenitor on record is one John Ker, a hunter in Swinhope, and however spelt, their surname always rhymes with star, despite having chosen a bold and triumphant sun to grace their crest, whose motto: Sero Sed Serio, translates from Latin as “late, but in earnest”. The Clan’s two branches descend from rival brothers, Ralph and John; the Kerrs of Ferniehurst tracing back to Ralph, and the Kerrs of Cessford to John. This distinction is pivotal, for just as the Kerrs were second only to the Scotts for sheer power and wealth in the Borders, they were also second only to the Douglases in the way that two houses divided nearly an entire bloodline. One generation after another, the governing branches of the Kerrs were always those families of Cessford and Ferniehurst, with never one in majority for very long, two great houses continually locked in fierce competition for land and wealth, as well as for the Wardenship of the Middle Marches, an office of great authority held for the majority of the 16th century by one Kerr branch, or the other. That goal alone proved so great a pursuit that it provided years of employment by the Kerrs for the small but ambitious Border family of the Rutherfords. But the post was not without grave risk: in 1511, Sir Robert Kerr, serving as Middle Marches Warden, was ambushed on a narrow, remote woodland track while on patrol, and murdered, by a trio of English outlaws. Two of the killers were caught in short order, but one of them escaped the grasp of the law, managing to vanish swiftly from common sight . . . but who was, in fact, secretly followed by two crafty Kerr kinsmen, men known by the surname of Tait. Over a period of weeks, the Taits tracked the culprit, a brigand named Starhead, across the breadth of the Marches, and over the Border into England, and finally, to tawdry lodgings in the English city of York. There, under cover of night, they finally confronted and seized the murderer, savagely slaying and decapitating him. Leaving their prey’s headless body spilling blood across the cobblestones, the Brothers Tait then rode for home, returning in high spirits to the Scottish Marches with the outlaw’s head proudly borne along in a burlap sack, and soon began presenting it for public display at the Kerr’s various family keeps, the message being simple and to the point: no-one crossed this Clan with impunity! In 1526, while attempting to liberate James V (then a minor) from his forced tutelage by the Douglas Earl of Angus, Scott of Buccleuch intercepted the royal progression in Melrose. Though commanding 600 lancers, his attempted “rescue” of the conspiring prince was defeated, largely due to Kerr riders from the houses of both Cessford and Ferniehurst, who slew nearly 100 of the liberators. Unfortunately, the rout was not absolute, as one of Buccleuch’s fleeing lancers turned on no less an opponent than Sir Andrew Kerr (at a place still called “Turn Again”), and in slaying his pursuer, initiated what became the long and “verrie bluddy” feud of the Kerrs versus the Scotts. Raging along for 26 years, the feud seemed to defy all attempts to be permanently quelled, including the marriage of Buccleuch and Janet Kerr of Ferniehurst, with the body-count between the two clans continuing to rise with waxing of each month’s moon, until the keystone incident of “the Murder in the High Street”, an event so alarming that it was immediately heralded throughout the taverns, barracks, coach stops and churchyards across all of southern Scotland. On that occasion, in 1552, clan chief Scott of Buccleuch was waylaid, alone and afoot, while visiting the city of Edinburgh, by a mixed party of Kerrs, Homeses, and other confederates, who viciously stabbed the old man to death in plain sight of onlookers. All passion and bravado aside, this deed proved to be a line whose crossing could not be borne. Report of the crime by the City Guard resulted in the assassins being swiftly declared outlaws by the Crown, causing every Scott clansman between Edinburgh and Gretna Green to go riding out hot for vengeance with steel bared, manning dire, torch-lit vigils at every bridge and crossroad across the Marches. Very soon thereafter, the Kerr lairds and chieftains, haggard from fleeing armed pursuit over virtually every mile they travelled, hastened to sue for peace with truces, treaties and further marriages, until all thirst for vengeance was suitably cooled. With the great feud finally over, the rivalry between Cessford and Ferniehurst flared back up, focusing on the town of Jedburgh, the folk of which the Ferniehurst Kerrs maligned for politically favoring the infant King James VI over Mary, Queen of Scots. Under that excuse, Sir Thomas Kerr of Ferniehurst, leading a band of Kerrs and Turnbulls, began campaigns of raid and pillage on Jedburgh in 1572. Lord Ruthven was dispatched from Edinburgh to defend the townsfolk, and at that point Walter Kerr of Cessford found enough grist in that churning cauldron to justify his joining the fray on the side of the defenders, in order to challenge his Ferniehurst rivals. To that end, Walter invited the Clan’s favorite henchmen, the Rutherfords, along at stirrup; in turn, they brought along a clutch of their cronies from Clan Bell. Never one to be outfoxed, Sir Thomas then turned his predatory attentions to the town of Roxburgh, recruiting the assistance of his cousin Robert Kerr of Ancrum, as well as the reviled wolfshead known as Alexander Trotter and his gang of highwaymen, in order to assure plenty of fire and sword. In the grand scheme, though, the checkerboard tactics of raiding or defending towns, rescuing or ransoming noblemen, and lifting or losing cattle, became mere details in a long, old chain of chaos; where the fruits of sacking and reiving beckoned, the House of Ferniehurst raised arms in the name of Mary, Queen of Scots, or the Catholic Earls, and then the Kerrs of Cessford would oppose them on behalf of James VI, either side often in alliance with the Eliotts, the Youngs or the Rutherfords. But most internicine struggles were ultimately resolved by default, through the Union of Crowns, when James VI of Scotland became James I of England in 1603, and also, finally, by the marriage of Anne Kerr of Cessford to William Kerr of Ferniehurst, from whom the Earls and Marquesses of Lothian descend. Their growing proclivity to behave in more upright and lawful ways, and do more to curry favor at the court of the powerful new King of Great Britain, served to place all the Houses of the Kerrs in the best position to acquire more honors, more titles, and more land. Strategically, these positions of royal favor also allowed them to avoid being leveraged into the attrition of the Scotch-Irish Plantation Act, which had forcibly relocated so many of the other reiving families of Borders, despite the fact that they raided alongside the Kerrs on many a moonlit night. The Armstrongs, the Bells, the Turnbulls, the Littles, the Youngs - they may have to learn to like the taste of Irish porridge, but ne’er a Kerr! When the last Jacobite uprising led to open rebellion against the throne of King George II in 1745, the Kerrs, unlike most of their Borders neighbors who had claimed neutrality, proudly pledged their allegiance and their arms to the Hanoverian forces, and along with a few other clans, such as the MacKenzies, the Campbells, and the MacKays, marched to war against the Highland regiments who fought for the dream of the Bonnie Prince. In points of fact, the Kerr’s Ferniehurst line alone boasted three nobleman who were high-ranking officers under the Duke of Cumberland, including a Knight of the Thistle, a colonel commanding troops of cavalry, and the defending governor of Edinburgh Castle. Since then, seldom has a generation passed with Kerr descendants absent from the annals of Parliament, the Royal Navy, University administration, or other seats of high, public service. Late, but in Earnest, they may have arrived, but what their history in Scotland lacked in age, these corrie-fisted men of the Marches more than made-up for, with an epic reach that seldom exceeded their grasp!